I’m finding it extraordinarily difficult to get a good pic of this yarn. Of course, if there were any light around here it might be easier. As it is, I’m stuck with a gray sky (and snow fall). This was the best I could get. 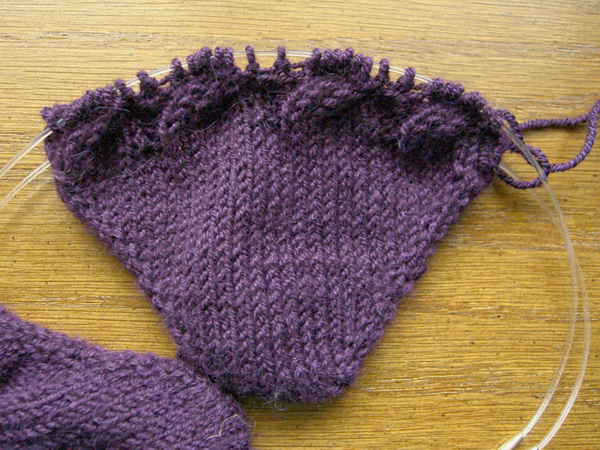 But you can see how I’ve done the first cable. The needles, unfortunately unseen in this picture, are my brand new 3.0mm Suzanne ebonies. ooooo… ahhhhh… yum!